I like to stay hydrated. No matter where I am I tote along water. I don't like to purchase bottled water for a number of reasons: the waste; the cost; the not knowing what may be leaching out of the plastic bottle and into my healthy sip of water. I also don't like having to slurp out of a water fountain. I don't know who licked the faucet last, or when it was last cleaned. I also don't enjoy the unpredicatbility of the stream. So what can I do? Easy, purchase a reusable bottle and lug my water straight from my tap (well, briefly filtered first). But then there started to be rumblings about the possibility of aluminum leading to Alzheimer's which made me nervous about these bottles, even though they are lined. Sufficient press about the dangers of BPA's soon made me suspicious of plastic bottles. Even the BPA-free plastic bottles, I remained wary of, not knowing if in a couple months a new study would point out another chemical lurking within. Panic, and thirst, was beginning to set in. 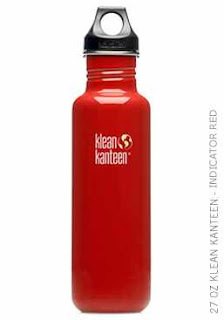 Then, I discovered Klean Kanteen, a stainless steel water bottle. No harmful chemicals, sturdy, totable. Perfect, right? Right... so I bought a knock-off. Another brand of stainless steel bottle. It was fine for a while, but then as I screwed the plastic cap on and off over and over again, the narrow, fine threads on the cap began to wear away, and the cap became a little loose. Mostly, it was fine apart from a little leakage if tossed on my car seat and left horizontal for a period of time. Then one day I picked it up by looping my finger into the cap, and as I lifted gravity fought me, and the cap remained looped on my finger as the bottle fell to the floor and water poured everywhere. Thirsty again, I decided to look again at the Klean Kanteen... a slightly more expensive option, but perhaps after all, the better option. I opened the cap that was on the bottle, admiring the display of extra caps merchandised nearby: sports caps, loop caps, flat caps. One plus that I could see straight off was that the mouth was wider, which meant that I might be able to cram in a small ice cube on a hot day, and there was less likelihood of the water funnelling straight down the narrow neck and right up into my nose. Learning from the last debacle, I closely examined the cap threads. Nice and wide, and quite rigid. The metal that they would be gripping also was much smoother. Far less chance that these threads would be wearing thin over time. And even if they did, I could buy a replacement cap. The company has also introduced stainless steel caps which should eliminate the problem all together. A fun thing about Klean Kanteen is their dizzying array of colours that are now available. No boring steel grey for me. Like my new cup from a couple weeks ago, I was drawn to the saucy red. I'm very excited by their website, where they show some of the new products that are now available: a new insulated kanteen for hot drinks, and even better, a wine karafe. I have not yet seen them for sale in Canada, but trust that my eyes will be peeled. In the meantime, these items are available through their website. The plastic that is used for water bottles is also used for soft drinks, teas, power drinks, etc. They are made from PET plastic which is identified by a number 1. PET plastic doesn't leach harmful chemicals. The problem with PET is that it is so durable it doesn't go away for several hundred years. It is possible to design PET plastic to be biodegradable which will allow it to biodegrade in a landfill. "Bottles for a Healthier Earth"